Well, its coming towards the end of 2013, and the time has come to start planning ahead for adventures in the year to come. I've been working away here in Portugal, saving, and I haven't been covering too many miles, so naturally my mind wanders on to what might be next for me and the Hiace.. 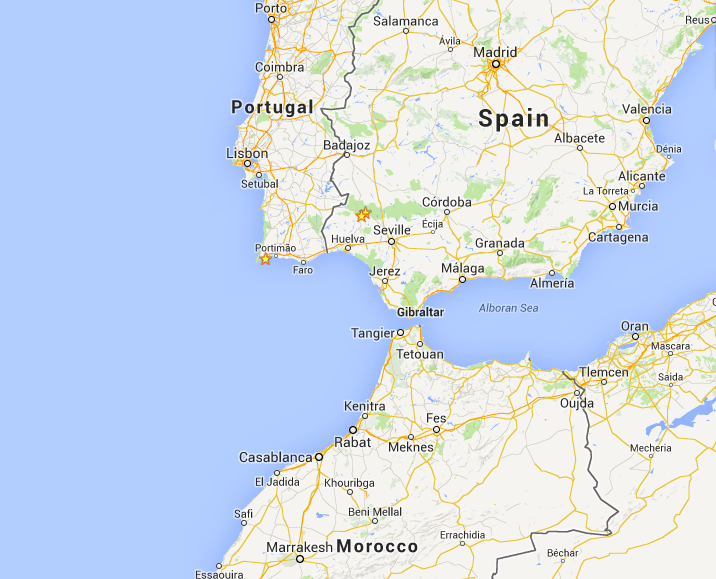 Since I'm already all the way down here in the south of Portugal, it seems like a great opportunity to explore further - if you look at a map, you can see all the places I am within a few days drive of. So.. I've been talking this over with my mate Rob, and we are looking into doing an exciting overland trip in our two 4WD Hiace camper vans. We are still exploring our options so I'm not able to elaborate on a route yet, other than to say that the trip may last up to a month and take in more than one country. With all this in mind, Rob has been spending the winter on his Ultimate 4WD Hiace project. Starting from a Yokohama converted part-time 4WD Hiace, very similar to my own, he's been prepping it for an overland trip, having modifications made, and going off for weekends of testing the van and the equipment. I'm going to share with you today some of the details of the off-road modifications to the van. Having planned out carefully what would turn his van into the ultimate off grid, go anywhere camper, Rob decided that as well as upgrading the suspension, he was going to need a recovery winch. This will mean that if one of our vans is to get stuck, its always possible to be pulled out, and get out of trouble with the least difficulty. The one chosen was a T-Max 9000lb winch which will be powerful enough to recover a vehicle of this size. I've put together some videos of the mods being done to Rob's Hiace. Check them out..
You might already have seen the post about my Hiace having the suspension lifted. Well, Rob decided to go for even more height on the back, so the standard rear leaf spring shackle extension would not be enough on its own. Talking it over with Dave, they decided the solution was to lower the front hangers for the rear springs - this would give an overall rear suspension lift of around 4". As you can see, the van is really coming along. I'll post soon about the interior and other changes he's made to his van. For off-road capability its there - BF Goodrich 235/70/16 Mud Terrain tyres, Winch, suspension lift & hi-lift jack mounted on the rear tow bar frame. Waffle boards on the roof for good measure. All the workshop photos from the videos, interior photos and more are here. Stay tuned for lots more about the vans interior, electrics, and more details about the trip we are planning! If this Hiace info has helped you, please consider making me a donation, I could certainly use it! Just click on the donate button on the right side-bar. Thank you! If you've any comments questions, thoughts please do share them below. Maybe its a Christmas present to himself? I can highly recommend bloodredoffroad for sure. Have a 4wd Hiace DX with manual hubs here in NZ and am looking at lifting and putting bigger tyres on for improved handling and ability on the beach (which I must say it already does pretty darn well). I was wondering whether you'd upload the workshop images from yours and Daves lift/mod jobs onto Tumblr or similar so I can have a good study? And I also want to say that I see you posting in some of the enthusiast forums round the net on lifting these vans and among the discussions your posts seem to come closest to reality than anything. I think what you've got going here is already the most comprehensive publication on the tubes regarding the improvement and modification of these off-roading living rooms. Keep it up! I've added a link to all the photos just below the last picture in the post above.